How does spacing apart sodium and potassium channels allow the action potential to travel faster down the axon? This is the reason always cited for saltatory conduction and myelination, but my mental model of conduction tells me that the density of ion gates along the axon should not affect the speed of the AP. To illustrate, consider a myelinated axon. A wave of Na$^+$ from action potential site 1, a node of Ranvier, rushes into and quickly diffuses down the axon. (It travels in both directions, but backwards is still in the refractory period.) It diffuses through the myelinated region, its concentration always diminishing. Before it attenuates too much, however, it happens upon node of Ranvier 2, where it triggers another action potential. A new wave of Na$^+$ rushes in and the cycle repeats. This should be plain so far. Now imagine that there is actually a node of Ranvier halfway between node 1 and 2, called node 1.5. The wave of Na$^+$, on its way to node 2, happens to trigger an action potential at node 1.5, from which a wave of Na$^+$ pours in and either boosts the original wave or replaces it by taking its momentum. Now the reinforced wave proceeds to node 2 and triggers it just as soon as, perhaps even sooner than, if node 1.5 had not existed. Repeatedly insert nodes at higher densities until the situation is simply lack of myelination, and we conclude that unmyelinated axons can transmit an action-potential-triggering wave of Na+ as fast as or faster than a myelinated one. In short, my point of confusion is this: I cannot see how a higher density of gated channels can possibly slow down the wavefront of Na+ that triggers action potentials. If anything, the additional influxes of Na+ should speed up the all-important wavefront, assuming that new waves really "either boost the original wave or replace it by taking its momentum", and also assuming that the wavefront of Na$^+$ is really all-important for signal transmission, and also assuming that the mere presence of (voltage?) 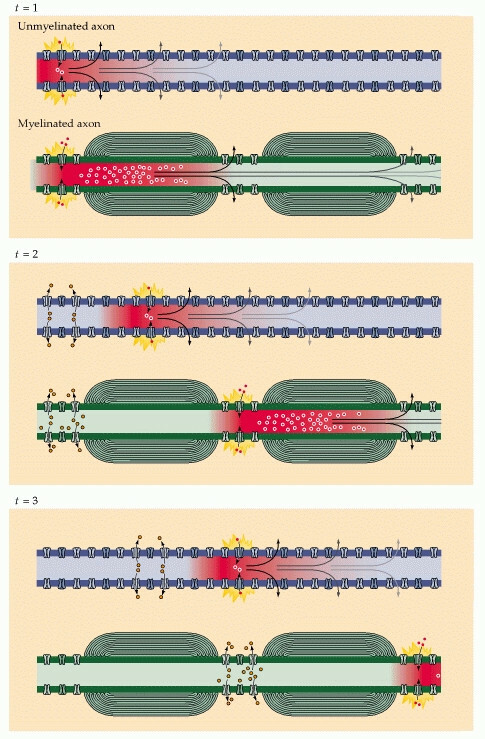 gated ion channels in the membrane does not significantly retard the wavefront. But the usual explanation for why saltatory conduction is faster than continuous conduction (a fact I hope is empirically and unambiguously established) relies on the putative slowing effect of ion channels on the signal fore. Please explain this effect in more detail, if it is not a misconception. Myelination acts as an electrical insulator and allows saltatory propagation. 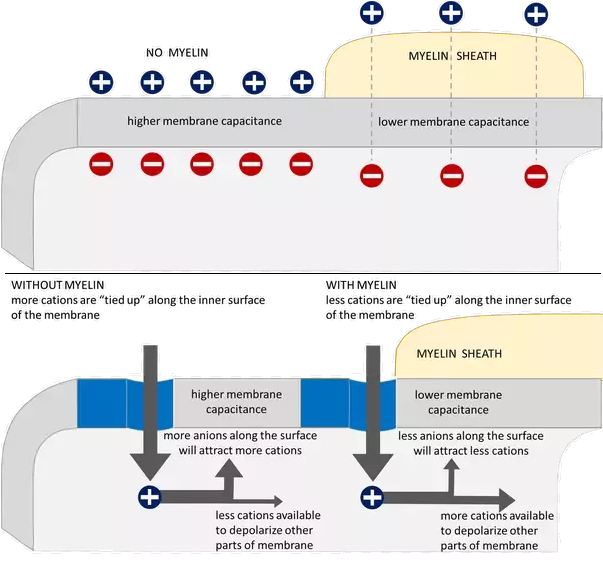 By reducing membrane capacitance and increasing membrane resistance, myelination increases the velocity of signal (i.e., Action Potential) propagation. So you're right: myelination speeds up electrical conduction. Unmyelinated axon conduction velocities range from about 0.5 - 10 m/s, while myelinated axons can conduct at velocities up to 150 m/s -- that's 10-30x faster!! When the neuron is at rest, ions are distributed so that the inside of the neuron cell is more negatively charged than the outside. This creates an electrical potential, called the resting membrane potential, across the cell membrane. Sodium and potassium channels in the cell membrane control the flow of positively charged sodium (NA$^+$) and potassium (K$^+$) ions in/out of the cell to maintain this negative charge. During depolarization, the cell membrane essentially becomes more permeable allowing NA$^+$ to enter the cell. This causes that section of axon to have a positive charge relative to the outside. When this positive voltage is great enough (i.e., when an action potential is created), the influx triggers the same behavior in the neighboring section of the axon. Gradually, this positive charge on the inside of the cell moves down the length of the axon to the axon terminals. In this process, action potential generation occurs repeatedly along the length of the axon. Each action potential takes time to occur. The charge (i.e., voltage) that is created dissipates with $ \uparrow $ distance. In fact, we have equations to calculate both the time a voltage change takes to occur and how current flow decreases with distance. Importantly, these equations rely on two constants: length and time. Resistance = the measure of the difficulty to pass an electric current through a conductor. Capacitance = the ability of a structure to store electrical charge. A capacitor consists of two conducting regions separated by an insulator. A capacitor works by accumulating a charge on one of the conducting surfaces, which ultimately results in an accumulation of oppositely charged ions on the other side of the surface. In a cellular sense, increased capacitance requires a greater ion concentration difference across the membrane. Larger cells have lower resistances and larger capacitances. Importantly, however, is that these variables also rely on membrane structure. c$_m$ (the capacitance of the membrane) decreases as you separate the positive and negative charges. This could be the result of additional cellular structures (e.g., sheaths of fat) separating intracellular and extracellular charges. r$_m$ (the resistance of the membrane potential) is the inverse of the permeability of the membrane. The higher the permeability, the lower the resistance. where, again r$_m$ represents the resistance of the membrane and r$_e$ and r$_i$ are the extracellular and intracellular resistances, respectively. (Note: r$_e$ and r$_i$ are typically very small). Basically, if the membrane resistance r$_m$ is increased (perhaps due to lower average "leakage" of current across the membrane) $\lambda$ becomes larger (i.e., the distance ions travel before "leaking" out of the cell increases), and the distance a voltage travels gets longer. How are the time constant and the space constant related to propagation velocity of action potentials? The smaller the time constant, the more rapidly a depolarization will affect the adjacent region. If a depolarization more rapidly affects an adjacent region, it will bring the adjacent region to threshold sooner. Therefore, the smaller the time constant, the more rapid will be the propagation velocity. If the space constant is large, a potential change at one point would spread a greater distance along the axon and bring distance regions to threshold sooner. Therefore, the greater the space constant, the more rapidly distant regions will be brought to threshold and the more rapid will be the propagation velocity. If you increase the layer of cells around the membrane, you decrease the electric field imparted by extracellular ions, which allows intracellular ions to move more freely in the axon. In other words, you decrease the capacitance. As a result, you have more cations available to depolarize other parts of the membrane. 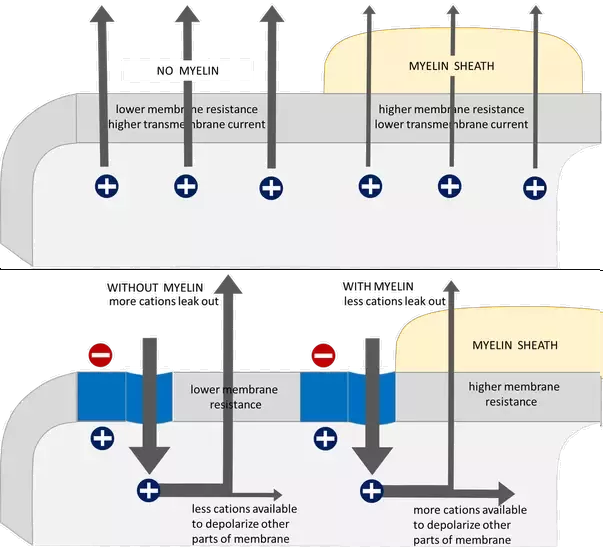 If you decrease the permeability of the membrane (i.e., if you prevent ion pumps from moving ions in/out of the axon), you increase the resistance of the axon membrane, which allows for the voltage created in the action potential to travel farther before dissipating. By allowing the voltage to spread farther before necessitating the generation of another action potential, you reduce the time it takes for signal propagation. In other words, if you "block" ion pumps and decrease the concentration of anions near the axon membrane, you increase membrane resistance (r$_m$) and decrease membrane capacitance (c$_m$), respectively. Together, this decreases the time of electronic conductance through the axon (and thus increase conduction velocity). Myelin greatly speeds up action potential conduction because of exactly that reason: myelin acts as an electrical insulator! Myelin sheath reduces membrane capacitance and increases membrane resistance in the inter-node intervals, thus allowing a fast, saltatory movement of action potentials from node to node. Essentially, myelination of axons reduces the ability for electrical current to leak out of the axon. More specifically, myelin prevents ions from entering or leaving the axon along myelinated segments. As a result, a local current can flow passively along a greater distance of axon. So instead of having to contantly generate new action potentials along each segment of the axon, the ionic current from an action potential at one node of Ranvier provokes another action potential at the next node. 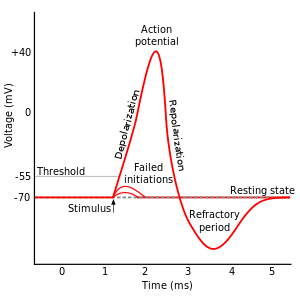 This apparent "hopping" of the action potential from node to node is known as saltatory conduction. So Why not Just Myelinate the Entire Axon?? 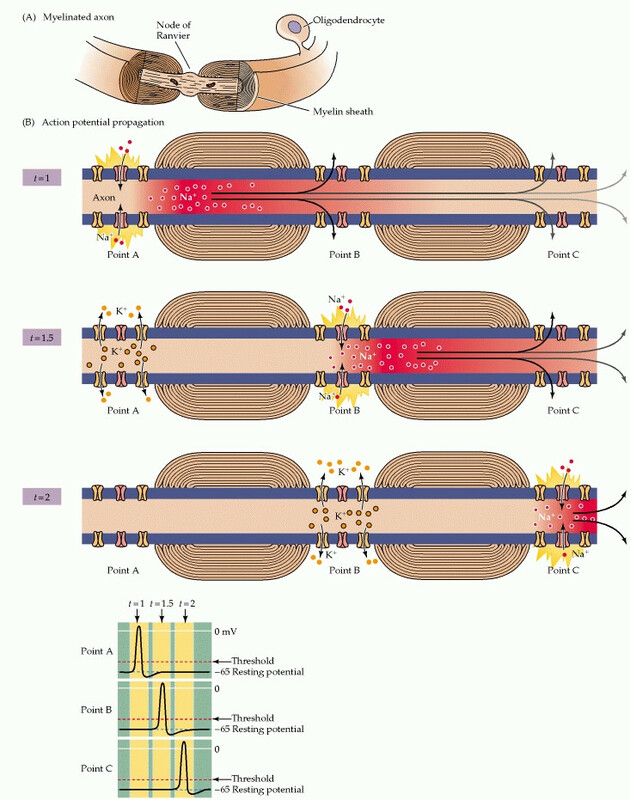 The length of axons' myelinated segments is important to the success of saltatory conduction. They should be as long as possible to maximize the speed of conduction, but not so long that the arriving signal is too weak to provoke an action potential at the next node of Ranvier. The nodes also can't be too frequent because, although adding a new node to the axon would increase its ability to generate sodium current, it would also increase the capacitance and thus diminish the effectiveness of other nearby nodes. Purves D, Augustine GJ, Fitzpatrick D, et al., eds. (2001). Neuroscience. 2nd edition. Sinauer Associates, Sunderland, MA. Byrne, J.H. 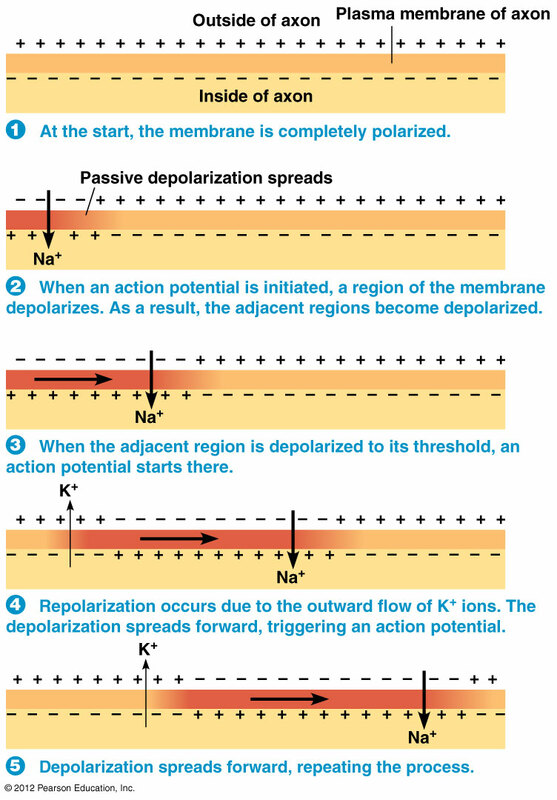 Chapter 3: Propagation of the Action Potential. Neuroscience Online. Univ. Texas. 1. Myelination decreases membrance capacitance. 2. Action potentials are metabolically expensive. The brain uses a lot of energy (about 20% of the body's metabolism at rest)! Maintaining the proper balance of ions inside the neuron is the major reason for this energy usage. Every action potential incurs metabolic cost and if we double the number of nodes along an axon, we (nearly) double the metabolic cost of propagating spikes down that axon. So although conduction velocity appears to be the primary determinant in the choice of internodal distance, it is important to remember that it is not the only factor the organism must take into account. While Luke's answer is perfectly correct, the answer can be given in a more intuitive manner. First, the main point is that it is increased positive voltage (inside the axon) that opens the sodium ion channels to propagate the action potential. The question is: how fast can this voltage get to the sodium channels? In an unmyelinated axon, the movement of voltage across the membrane is due to ion flux (i.e the flow of ions through the channels, the current), and this movement is limited by the time it takes for the sodium ions to diffuse into the axon. On the other hand, in a myelinated axon, the first bolus of sodium enters at the axon hillock. Because the capacitance is low, this means that the voltage can propagate down the axon, not by ion diffusion, but as an electrical field. The electrical field carries the voltage force much much faster than ion diffusion. Therefore, when the ions first enter, the voltage force moves, basically at the speed of light to the next node, where the voltage force opens the sodium ion channels there. So, by allowing the voltage to be carried by the electrical field, the effect is that the distance between the nodes is effectively eliminated. Myelinated axons conduct faster because they are >>effectively<< much shorter than unmyelinated axons. Finally, the optimized distance between nodes mentioned by Luke is exactly that distance in a given type of neuron's axon where the voltage force decays to the bare minimum needed to activate the sodium ion channels at the next node. Not the answer you're looking for? Browse other questions tagged cell-biology neuroscience neurophysiology biophysics electrophysiology or ask your own question. Why do myelinated axons conduct impulses faster? Elements that make action potential to conduct quicker?